Let’s face it, the coal industry is on life support. President Donald Trump has called in his emergency team to try and revive the industry. But any success is likely to be short-lived. Coal is taking its last breaths. What’s killing it? Regulations played a role. As did environmental groups, which have attacked the industry for years. But the real culprit is … the free market. As the U.S. Energy Information Administration (EIA) graph shows, U.S. coal production, which peaked in 2006, has been on a gradual decline—roughly coinciding with the fracking boom that has made the U.S. the world’s largest producer of crude oil and natural gas. As natural gas supplies dramatically expanded, the price fell, making natural gas one of the least expensive options for electricity generation. And natural gas releases about half the carbon emissions of coal, which means power generators switching to gas can avoid some of the heat coming from environmental groups. Indeed, the shift to natural gas is one of the primary reasons the U.S. is reducing carbon emissions more than all of the European Union members that try to carbon-shame us. And natural gas has multiple uses, so producers have multiple markets for their product. For example, several cruise liners have ordered 125 new vessels that will be powered by liquefied natural gas (LNG), on top of 119 already in production, according to the Wall Street Journal. As for coal, the EIA says that 90 percent of U.S. coal production is used for power generation—the very market that is slowly being taken over by gas. Coal used to produce about 50 percent of our electricity; it now produces only 30 percent. 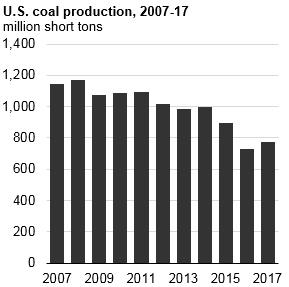 There was a 2017 uptick in coal production. Was that the “Trump resuscitation effect”? Actually, the EIA points out that there were several mergers from failing coal producers that allowed them to consolidate costs, lower prices and increase sales. In addition, coal exports rose as China, Japan and India tried to offset disruptions in their coal supply from Australia. Whether that export market continues is anyone’s guess. But all of those countries are also being pressured to make the shift from coal to cleaner energy sources. No one should be surprised, least of all President Trump, that the coal industry is in decline. The free market is one of the biggest destroyers of companies and industries. Regulations also kill a lot of companies and industries. But the difference is that the free market replaces the dying industry with a better one that the public wants and is willing to pay for. Regulations often replace a dying industry with one politicians and bureaucrats claim the public should want.